Homestead Hebrew Congregation donated its Judaica, yahrzeit plaques, and Torahs to Beth Shalom, a Conservative synagogue in Squirrel Hill. They turned their fourth-floor gym into the Homestead Hebrew Chapel, where they installed the aron kodesh removed from the synagogue, hung the plaques, and used the Torahs for youth services held there. Not even four years after the Homestead shul closed, tragedy struck in the form a fire that caught the attention of all of Pittsburgh, not just its Jewish community. דער מענטש טראַכט און גאָט לאַכט — Man plans, and G-d laughs, indeed. 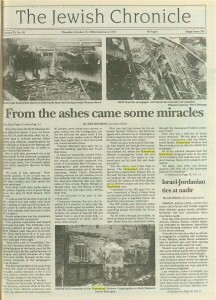 After these events, the Torahs were buried in December 1996. 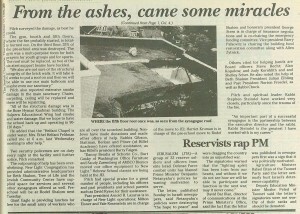 Photograph of the destroyed Homestead Hebrew Chapel in Beth Shalom (from 10/17/96 Chronicle). You can make out the melted yahrzeit plaques on either side. As the fire alarm blared through Beth Shalom Congregation’s synagogue, office manager Jill Rook sought out the maintenance man to question why afternoon preschool classes were being interrupted by a fire drill. Alerted by the alarm, about 100 staff members and students attending preschool classes at Beth Shalom in Squirrel Hill marches to safety outdoors after fire broke out there at 2:15 p.m. yesterday. But two firefighters were injured while battling the six-alarm blaze, which heavily damaged the top two floors of the congregation’s five-story community building. The fire is also believed to have destroyed two irreplaceable religious texts that had been stored on one of the upper floos. Firefighter Alfred Glaze, 41, suffered second-degree burns to his arms, neck, and shoulders when smoldering embers fell on him. Glaze was in serious condition last night in the burn unit at Mercy Hospital. Fire Capt. Robert Shuster suffered from hypertension at the scene and was taken to St. Francis Medical Center. He was in good condition last night, a hospital spokeswoman said. The fire was discovered about 2:15 p.m. by the head of maintenance at the Beth Shalom complex at Shady Avenue and Beacon Street. About 70 firefighters and 30 other emergency workers, including police and paramedics, worked through the afternoon. Agents from the federal Bureau of Alcohol, Tobacco and Firearms assisted with what city fire officials termed a routine investigation. The cause had not been determined, but Pittsburgh Fire Chief Charlie Dickinson said the fire did not appear to be suspicious. The main sanctuary building sustained damage from smoke and water. But that building, which dominates the corner of Beacon and Shady and stretches a block to Bartlett Street, was structurally unaffected, said Amir Pilch, director of the synagogue. The synagogue’s Halpern Center for Education — a two-story structure at the west end of the complex — also was not seriously damaged. It was the five-story Rose Hyman Kaufmann Community Building that took the brunt of the damage. That building, which is more than 70 years old, is between the education center and the sanctuary. Dickinson said the maintenance man noticed the fire in the kitchen on the fourth floor next to the gymnasium. Office and a lounge for a youth group also were housed on that floor, between the gym and the kitchen. Dickinson said the fire quickly spread to the fifth floor, which housed meeting rooms. As the fire raged, the the fourth and fifth floors and the building’s roof collapsed into the third floor, where, minutes before the fire, preschool classes were being held. None of those children, all between 2 and 5 years old, were injured. Nor were any of about a dozen staff members who had been with them inside. But parents and relatives, expecting a routine dismissal of classes, were shaken to find firefighters and fire engines surrounding the Beth Shalom complex. “it was trying for the arriving parents,” Rook said. Sarah Firestone, 15, who tutors third- and fourth-graders in Hebrew at the community center, said she was on her way to meet friends in the class when she saw all the fire equipment. Rabbi Chuck Diamond, the congregation’s education and youth rabbi, said two Torahs used for youth group prayer were lost in the fire. Those Torahs had been stored in an ark that had been housed in the community building. Diamond said no preschool or after-school Hebrew classes would be held through Sunday. Pilch said arrangements were being made to hold those classes at other locations. The congregation’s telephone number has been forwarded to the office of New Light Congregation on Beechwood Boulevard, which will serve as “our base of operations the immediate future,” Diamond said. He said he would not be sure until at least later today whether Beth Shalom’s main sanctuary would be useable for services Friday and Saturday. People rushed to the Beth Shalom Congregation yesterday afternoon to save what was sacred to them. “I was driving up Shady, all I see are police cars, and I think the worst,” said Marcia Greenwald, whose 3-year-old daughter was one of the preschoolers evacuated from the burning building. Preschool teachers and children were gathering at a house a few doors up from the 79-year-old main building, eating pretzels and drinking apple juice. 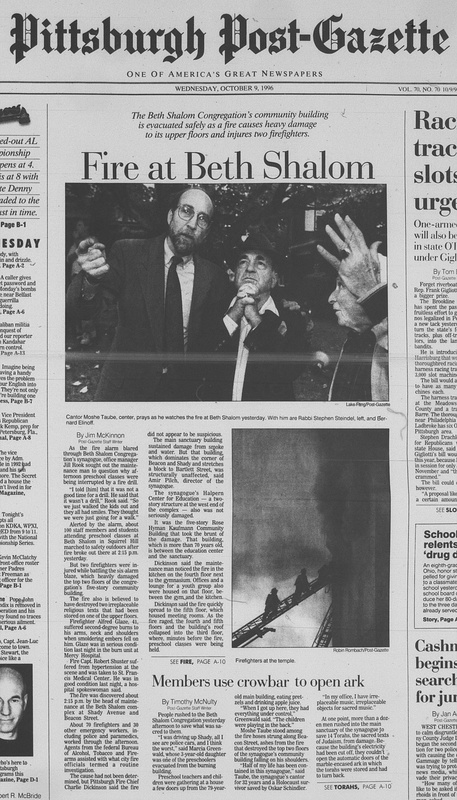 Moshe Taube stood among the fire hoses strung along Beacon Street, ashes from the fire that destroyed the top two floors of the synagogue’s community building falling on his shoulders. “Half of my life has been contained in this synagogue,” said Taube, the synagogue’s cantor for 32 years and a Holocaust survivor saved by Oskar Schindler. At one point, more than a dozen men rushed into the main sanctuary of the synagogue to save 14 Torahs, the sacred texts of Judaism, from damage. Because the building’s electricity had been cut off, they couldn’t open the automatic doors of the marble-encased ark in which the Torahs were stored and had to turn back. “We went down the main aisle. I couldn’t see anything — I was choking,” said Richard Linder of Squirrel Hill. Allan Friedman, 16, went to a firetruck and took a crowbar. He and some others went back into the sanctuary and pried the doors open. “Mommy, did they get the Torahs?” said Morgan Blumenfeld, 5, as her mother, Sheryl, held her. Just after her question, the men emerged from the building carrying them. “They got the Torahs!” her mother shouted. The men wrapped the Torahs in shawls and took them to three nearby houses. With Allderdice High School out of session for parent-teacher conferences, Aryeh Selekman, 15, and Dena Stein, 16, went to the synagogue’s youth center to send out some mail. They were near the old Homestead Hebrew Congregation space, moved into an upper floor of Beth Shalom two years ago. The area would later bear near-told damage. The two left 15 minutes before the fire started. “I was walking down the street and I saw the smoke, and I was like, it couldn’t be,” Selekman said. The youth group used the Homestead space and Torahs for services. Last weekend, they had celebrated Simchat Torah, a holiday dedicated to giving thanks for the sacred manuscripts. The two Torahs from Homestead Congregation were the only manuscripts lost in the fire, Rabbi Stephen Steindel said. The fire started in a part of the building between the school wing and the main worship space. It was discovered as preschool was being dismissed. The teachers told the approximately 100 children that they were having a fire drill, and they walked out quietly. Last night, synagogue leaders were trying to determine where preschool classes would meet. Daily services, Steindel said, will be held for the time being at the New Light Congregation on Beechwood Boulevard. Steindel said he hoped to have the sanctuary open by Saturday, when Brett Kotler, 13, has his bar mitzvah. Lois Kotler, Brett’s mother, said she had scolded her son earlier in the day. There were no deaths from the million-dollar fire that damaged part of the 73-year-old original building of Beth Shalom Synagogue on Tuesday, but there will be one burial. That would be for the remnants of the two Torah scrolls lost in the fire that stunned many members of Squirrel Hill’s Jewish community. Judaism treats the handwritten scrolls as sacred objects, and space will be made at Beth Shalom’s cemetery in Shaler for whatever is found of them in the burned building. A memorial service will accompany the burial. Part of one burned Torah was collected yesterday. A rescue party of congregants safely removed at least 20 other Torahs during the fire from other sections of Beth Shalom that weren’t ablaze, and those were taken to nearby home of congregants for safekeeping. “Anything with God’s name in it, we look to respect and treat with dignity,” and a Torah is the most notable example of that, said Rabbi Chuck Diamond, head of the congregation’s youth and education programs. Diamond and other officials from the region’s largest Conservative Jewish congregation had little rest Tuesday night and yesterday. Even while fire units had to return to Beacon Street and Shady Avenue twice yesterday to douse flare-ups of debris from the fire, Beth Shalom’s leaders were in temporary headquarters to begin dealing with details of rebuilding the heavily damaged community center and administrative office section of the synagogue. 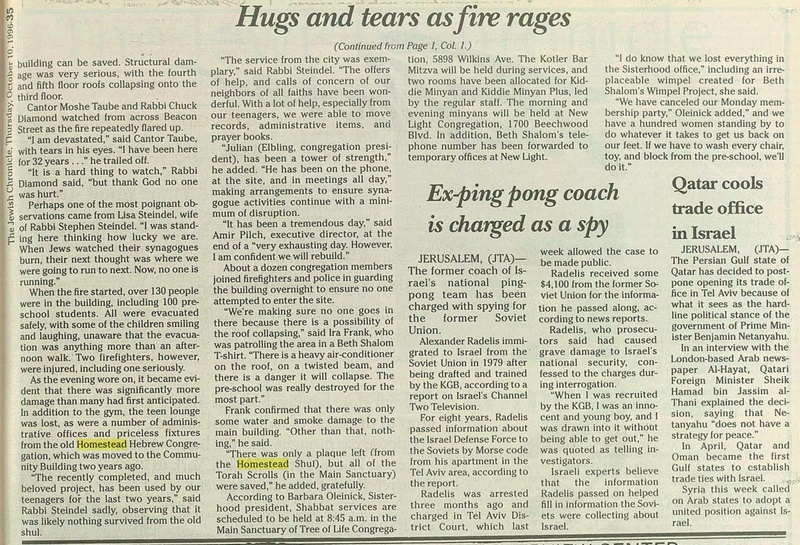 They also had to arrange less serious restoration of the large sanctuary, which had smoke damage, and of the water-damaged classroom section; find alternate space for offices, worship, pre-school and after-school classes; and handle all of the related communications necessary with insurance and city fire officials as well as the 1,200 families in the congregation itself. But there were plenty of offers of help. “I didn’t have to look–everyone came to me,” said Amir Pilch, Beth Shalom executive director, referring to offers of space and support that came in from many local synagogue as well as non-Jewish institutions. Beth Shalom has accepted offers of offices and daily worship space at the nearby New Light Congregation on Beechwood Boulevard at Forbes Avenue. The Tree of Life Congregation has donated its sanctuary on Wilkins Avenue for Saturday Sabbath services. The Beth Shalom sanctuary may be ready for reuse within a week, but Pilch said the 150 students in an after-school Hebrew program will need to use space provided by the Jewish Education Institute at the former St. Philomena Church for at least 60 to 90 days. The Tuesday, Thursday and Sunday classes were canceled for this week, but they will resume Tuesday in the institute’s classrooms. The 135 children in the preschool program also will be housed elsewhere for the next several months. A decision on that location was expected today. The Beth Shalom officials said they expected fire damage to exceed $1 million, which will include rebuilding the gymnasium, youth lounge and other facilities destroyed on the upper floors of the five-story Rose Hyman Kaufmann Community Building. Pilch said the construction would take at least six to eight months, and that insurance would cover the full costs. Pilch said the most unfortunate loss in the fire was the possessions of the former Homestead Hebrew Congregation, which went out of existence two years ago. Beth Shalom designated space to keep that congregation’s memories alive on an upper floor of the community building, and it was that congregation’s Torahs that were destroyed. City fire officials said they had not determined the cause of the blaze, which they believed began on the fourth floor. A small kitchen is connected to the gymnasium there, and although no cooking or activity was taking place at the time of the fire Tuesday afternoon, the kitchen area was the likely origin of the fire, Deputy Fire Chief Pete Micheli said. At 3 p.m. on Monday afternoon, passersby, congregants, and news reporters watched as dozens of firefighters tackled a devastating fire at Congregation Beth Shalom. Flames leapt from the roof of the Rose Hyman Kaufmann Community Building and black smoke billowed from the windows, as firefighters worked to contained the six-alarm blaze. Despite the thick mist of water, smoke and ash that settled over all, most stayed to watch, holding hands, hugging and comforting each other. There were numerous offers to help, and when firefighters decided to allow some people in to save the synagogue’s Torah scrolls, no one hesitated to enter the hot and smoky sanctuary. The brass gates which protect the scrolls in the Main Sanctuary, were locked, shut due to the loss of power. Once they were pried open with a crowbar, a human chain was formed, and the scrolls were moved to the neighboring houses for safekeeping. In all, 21 scrolls were saved, while two, used primarily for youth services, were lost. ATF officials were on site, but the fire was not considered suspicious. While it will be at least a few days before anything is known for certain, firefighters suspect the fire began in the fourth floor kitchen of the Community Building, just at the back of the gym. The alarm went off at approximately 2:15 p.m., after a mother, who was picked up her pre-school child, smelled smoke, and a maintenance man simultaneously discovered the fire. Damage estimates of $1-1.5 million have been reported, but according to synagogue officials, it will be impossible to know until insurance representatives and contractors arrive on the scene. It is also unclear whether the community building can be saved. Structural damage was very serious, with the fourth and fifth floor roofs collapsing onto the third floor. 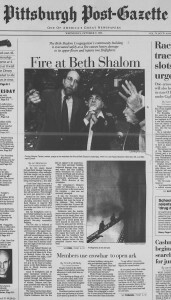 Cantor Moshe Taube and Rabbi Chuck Diamond watched from across Beacon Street as the fire repeatedly flared up. “I am devastated,” said Cantor Taube, with tears in his eyes. “I have been here for 32 years…” he trailed off. When the fire started, over 130 people were in the building, including 100 pre-school students. All were evacuated safely, with some of the children smiling and laughing, unaware that the evacuation was anything more than an afternoon walk. Two firefighters, however, were injured, including one seriously. As the evening wore on, it became evident that there was significantly more damage than many had first anticipated. In addition to the gym, the teen lounge was lost, as were a number of administrative offices and priceless fixtures from the old Homestead Hebrew Congregation, which was moved to the Community Building two eyars ago. “The recently completed, and much beloved project, has been used by our teenagers for the last two years,” said Rabbi Steindel sadly, observing that it was likely nothing survived from the old shul. “The service from the city was exemplary,” said Rabbi Steindel. “The offers of help, and calls of concern of our neighbors of all faiths have been wonderful. With a lot of help, especially from our teenagers, we were able to move records, administrative items, and prayer books. “Julian (Ebling, congregation president), has been a tower of strength,” he added. “he has been on the phone, at the site, and in meetings all day,” making arrangements to ensure synagogue activities continue with a minimum of disruption. About a dozen congregation members joined firefighters and police in guarding the building overnight to ensure no one attempted to enter the site. Frank confirmed that there was only some water and smoke damage to the main building. “Other than that, nothing,” he said. “There was one a plaque left (from the Homestead Shul), but all of the Torah Scrolls (in the Main Sanctuary) were saved,” he added, gratefully. According to Barbara Olenick, Sisterhood president, Shabbat services are scheduled to be held at 8:45 a.am. in the Main Sanctuary of the Tree of Life Congregation, 5898 Wilkins Ae. The Kotler Bar Mitzva will be held during services, and two rooms have been allocated for Kiddie Minyan and Kiddie Minyan Plus, led by the regular staff. The morning and evening minyans will be held at New Light Congregation, 1700 Beechwood Blvd. 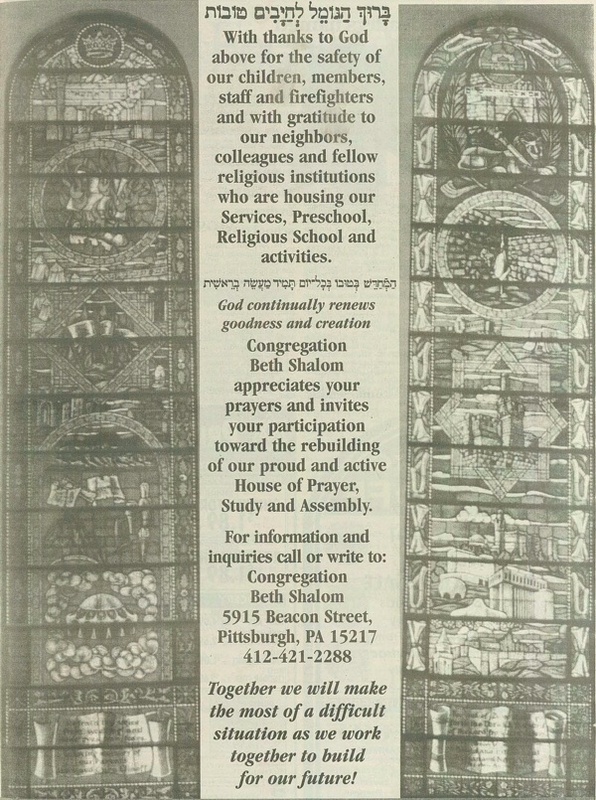 In addition, Beth Shalom’s telephone number has been forwarded to temporary offices at New Light. “I do know that we lost everything in the Sisterhood office,” including an irreplaceable wimpel created for Beth Shalom’s Wimpel Project, she said. Nearly 18 hours after fire raged through Congregation Beth Shalom, causing about $1 million in damage, the smell of smoke still hung in the air, an acrid reminder of one of Squirrel Hill’s saddest moments in recent history. The grand old Squirrel Hill landmark sustained major fire damage, and The Chronicle join the Congregation in mourning their loss — material, physical and spiritual. It was a frightening sight, to see flames shooting towards the sky, endangering not only property, but lives as well. Congregants wept — as did the entire Jewish community. 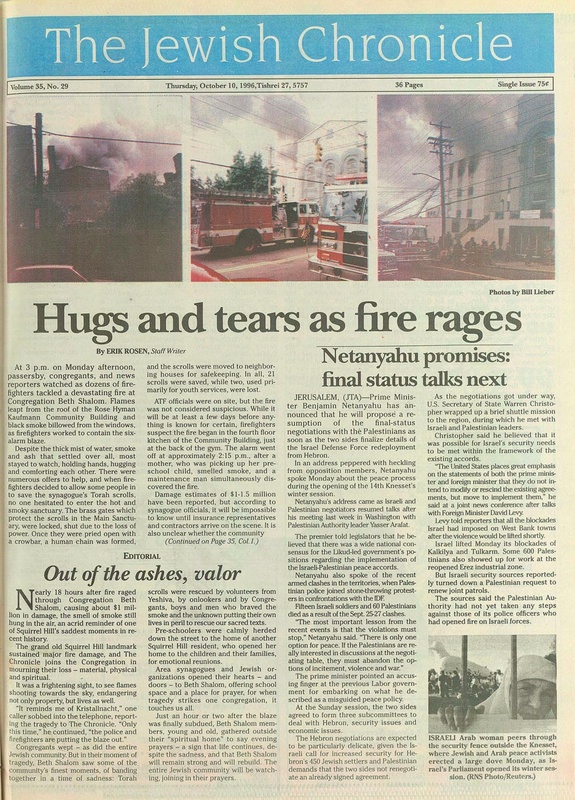 But in their moment of tragedy, Beth Shalom saw some of the community’s finest moments, of banding together in a time of sadness: Torah scrolls were rescued by volunteers from Yeshiva, by onlookers and by Congregants, boys and men who braved the smoke and the unknown putting their own lives in peril to rescue our sacred texts. Pre-schoolers were calmly herded down the street to the home of another Squirrel Hill resident, who opened her home to the children and their families, for emotional reunions. Area synagogues and Jewish organizations opened their hearts — and doors — to Beth Shalom, offering school space and a place for prayer, for when tragedy strikes on congregation, it touches us all. Just an hour or two after the blaze was finally subdued, Beth Shalom members, young and old, gathered outside their “spiritual home” to say evening prayers — a sign that life continues, despite the sadness, and that Beth Shalom will remain strong and will rebuild. The entire Jewish community will be watching, joining in their prayers. From the time the Beth Shalom fire was detected about 2 p.m. on Tuesday, Oct. 8, until shortly after 4 p.m., there was a serious consideration by fire officials to abandon fire fighting and let the fire burn itself out, in order to save lives of the firemen. Was it luck that prevented the total destruction of the landmark synagogue and kept the approximately 130 persons inside from harm, The Chronicle asked Amir Pilch, executive director of Beth Shalom. From what could have easily been a far greater tragedy, a lot of good things came into play for Beth Shalom, Pilch noted. Nearly miraculous was the immediate response from the community. There were a lot of “incredibles” during the Chronicle interview with Pilch–partly because of the hectic pace his life assumed since the fire, partly because of fatigue, and partly because of a high fever–but mostly because of the community response to the synagogue’s hour of need. 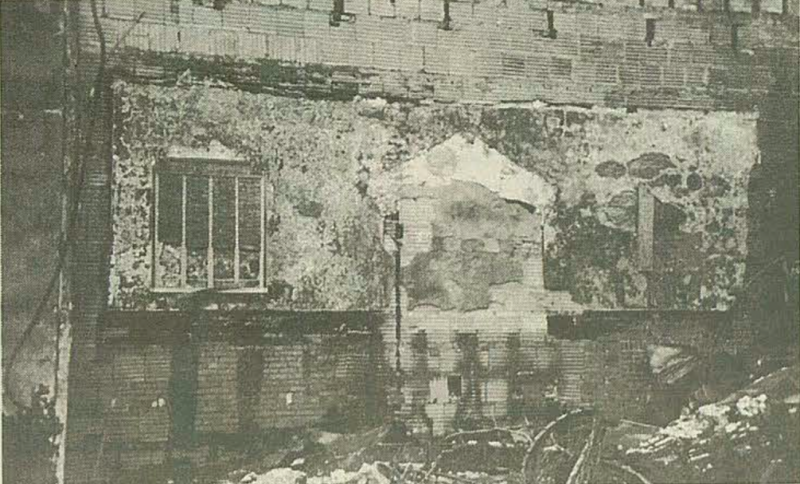 The fire had smoldered for some time before the smell of smoke became detectable, mainly because of the 8 1/2 inch plaster, pebble and chicken wire walls and ceiling in the structure. “That probably saved us,” he said. Despite the thick walls, at about 4 p.m. last Tuesday, Assistance Chief of Fire Prevention Peter Micheli conferred with Pilch. 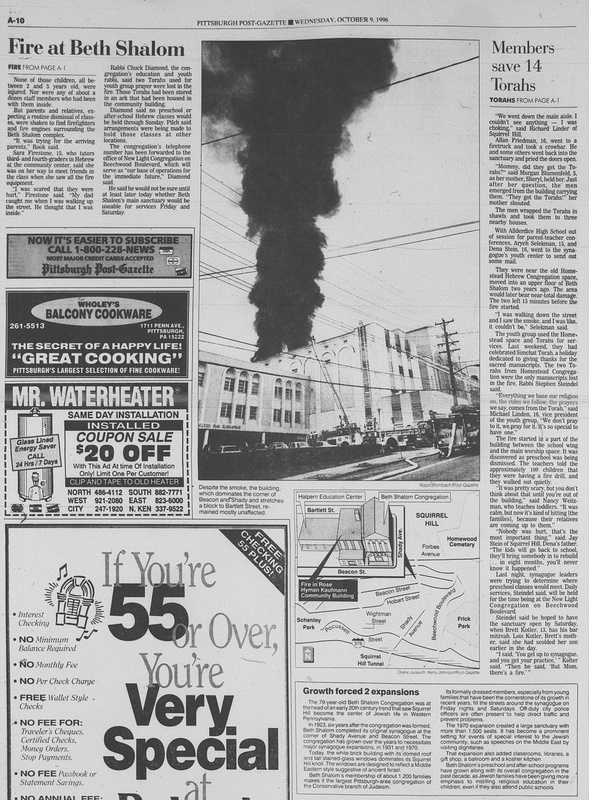 Six alarms had been sounded and 90 firemen were doing their utmost to gain control over the conflagration, but the fire still had the upper hand. 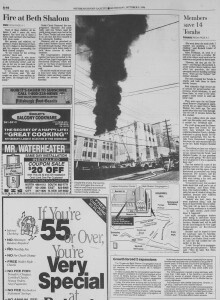 If the fire wasn’t soon under control, Micheli said, they might have to let it burn itself out to save firemen’s lives. “Captain Micheli’s men said, ‘let us save the building.’ And they did.” It was that close. 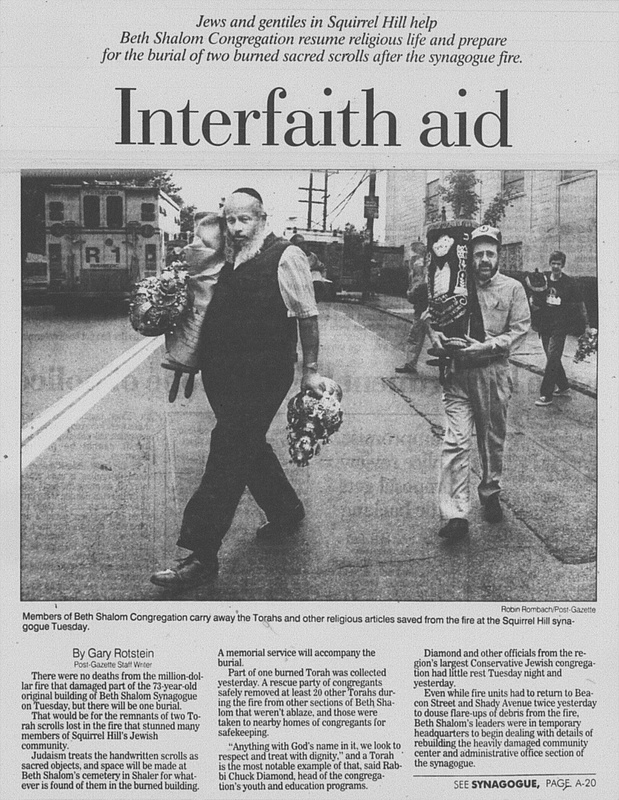 A flood of memories moved Pilch: “The incredible work of the fire captain, the overall community response, the work of Councilman Bob O’Connor, our congregation past presidents using brooms to sweep water out of the main sanctuary, Rabbi Chuck (Diamond) holding services for the children out on the sidewalk with the adults joining in, the executive directors like Joel Goldstein of Tree of Life, Phyllis Weinkle of Temple Sinai, and Jeff Herzog of Rodef Shalom by my side right away, offering their help. Contractor Dominic Riccuiti, who installed B.S.’s elevator to help make the building handicapped accessible, heard of the fire while driving his truck on the Parkway. He exited at Squirrel Hill and rushed over to see if he could help — a response repeated in other ways by many other people. Pilch also had high praise for the six federal Alcohol, Tobacco, and Firearms Agents who showed up to investigate–a routine required since the rash of church fires this year all over the country. “These six guys were super individuals who helped me through the trauma. They urged me into the gym area which was hardest hit, where the Homestead Hebrew Congregation Torah Ark and scrolls were kept. The agent in command gave me his hard hat and made me wear it. “The fire debris was 8 feet high in places. The Homestead Art had replaced the original Beth Shalom Ark o the wall. We had dismantled and stored our original ark. All that was left on the wall was the outline of the Beth Shalom ark (a different shape and size than the Homestead one). 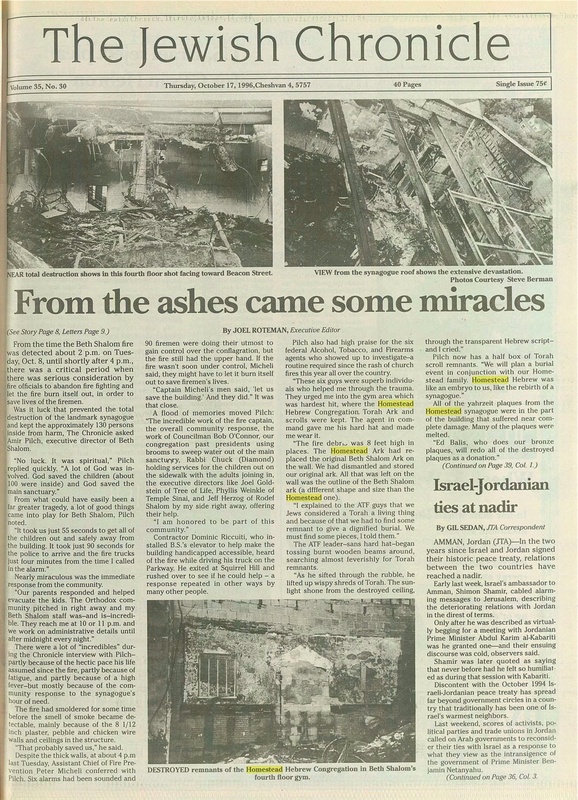 The ATF leader–sans hard hat–began tossing burnt wooden beams around, searching almost feverishly for Torah remnants. All of the yahrzeit plaques from the Homestead synagogue were in the part of the building that suffered near completed damage. Many of the plaques were melted. Pilch surveyed the damage, as best he could. The gym, fourth and fifth floors, where the fire probably started, is totally burned out. On the third floor, 35% of the pre-school area was destroyed. The gym was a multi-purpose room for both prayers for youth groups and for sports. The roof must be replaced, as two of the six steel support beams have buckled. Pilch also reported extensive smoke damage in the main sanctuary. Chairs, carpeting, ceiling will be replaced and there will be repainting. Last Tuesday afternoon’s tragic fire at Congregation Beth Shalom in Squirrel Hill resulted in extensive damage. While the structural damage is immense, the Congregation — and the Jewish community — suffered an immeasurable loss when artifacts and Judaica from the Homestead Hebrew Congregation went up in smoke. Beth Shalom had been home to Homestead’s five Torahs, silver crowns and mantles, bimah, lectern, prayers, memorial plaques, and other Judaica for several years. The Homestead Chapel, or Homestead Room, as it was affectionately known to its former congregation, was used daily by Congregation Beth Shalom’s active United Synagogue Youth members, for services, meetings and more. 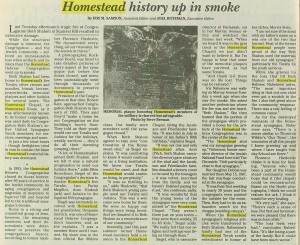 In just a few short hours — though firefighters tried in vain to contain the blaze — Homestead’s material history was destroyed. 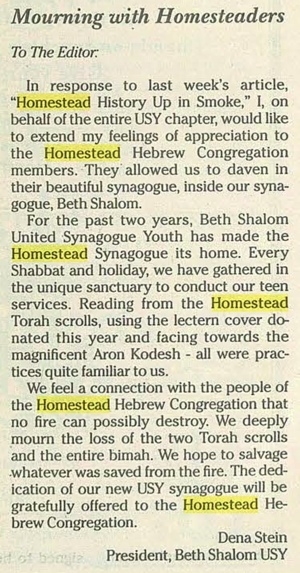 In 1993 the Homestead Hebrew Congregation closed its doors forever, after 99 years of service to the Jewish community. 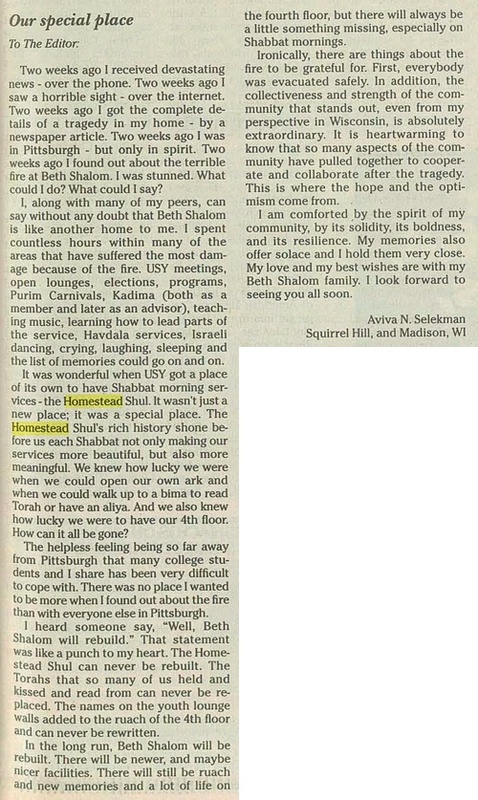 An aging congregation and migration of members to Squirrel Hill and beyond led to the traditional synagogue’s demise. A photographer, Lockwood Hoehl, was hired to take detailed pictures of every aspect of the synagogue just before the doors closed, and members painstakingly went through thousands of documents to preserve Homestead’s past. 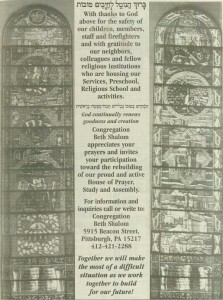 “A lot of Homesteaders joined Beth Shalom, and we felt it was a natural progression to send our Judaica there,” adds Ellen Burechson Siegel of the Congregation’s decision to donate Homestead’s five Torahs, two Purim Megillot, Aron Kodesh (ark) and Judaica to the Squirrel Hill synagogue. Ironically, just this past summer former Homestead members held a reunion in the Homestead Chapel, feting the Jacobson and Friedlander families. “It was held in July in honor of my father’s 80th birthday,” explains Siegel. “It was our one and only Homestead affair. Amir (Pilch, Beth Shalom executive director) gave a history of the shul and the Jacobson and Friedlander families donated a lectern cover to be used by the teenagers — it was velvet, inscribed from the family, and we haven’t finished paying for it yet,” she continues, sadly. 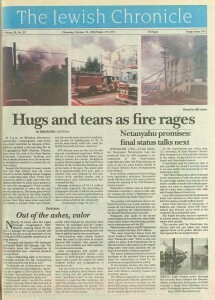 Siegel, who is executive director of Hadassah, sat in her Murray Avenue office and watched the flames last week. “When we heard it was in the gym (next to the Homestead Chapel) we just didn’t want to believe it. 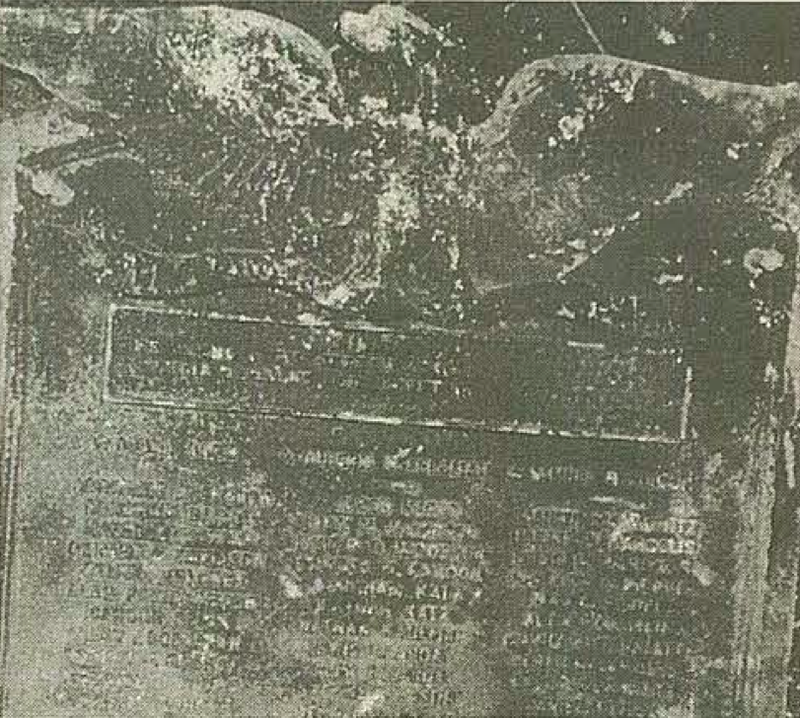 But I’m happy to hear that some of the memorial plaques have survived, as had some Torahs. Iris Nahemow was walking on Murray Avenue Tuesday a week ago when she saw the smoke. She asked another pedestrian where the fire was and she heard, “Beth Shalom.” She then learned that the portion of the synagogue which provided a home for the artifacts of the Homestead Hebrew Congregation was at the center of the blaze. 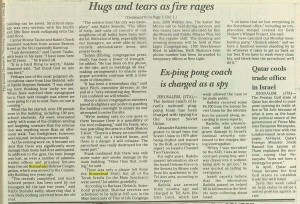 Her daughter Debbie was married there May 15, 1987, the last marriage conducted at the synagogue. When the Homestead synagogue’s religious articles were transferred to Beth Shalom, Nahemow’s family had one of the Homestead Torah scrolls rededicated in honor of her father, Morris Stein. 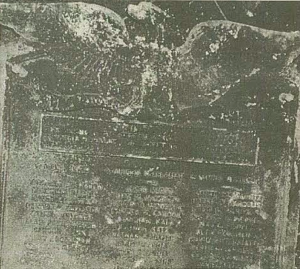 “I am not sure if the scroll with my father’s name on it was one of the two that burned. Most of the former Homestead people were proud of the way Beth Shalom used the materials from our old synagogue,” particularly the Torahs for the youth services. Florence Hiedovitz thinks it is time for healing. 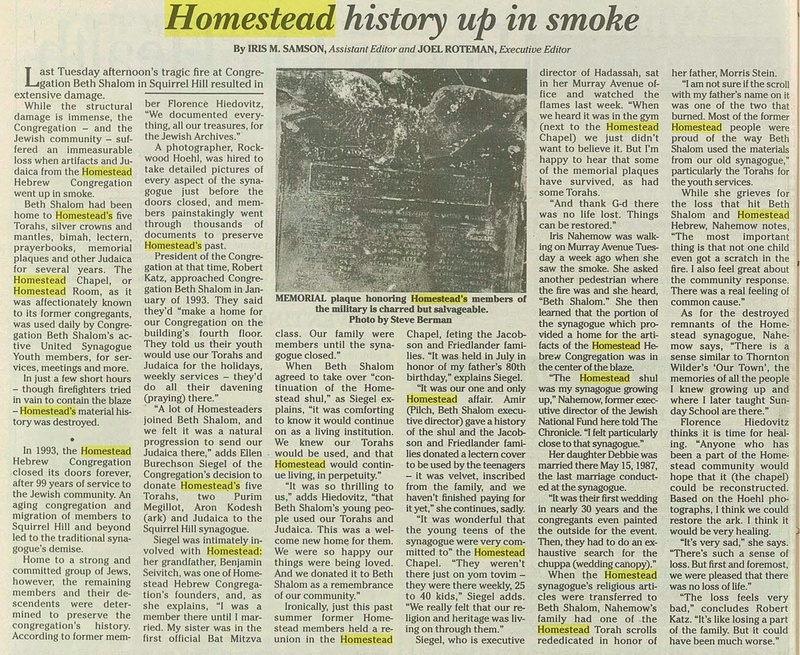 “Anyone who has been a part of the Homestead community would hope that it (the chapel) could be reconstructed. Based on the Hoehl photographs, I think we could restore the ark. I think it would be very healing.